There was a bit of reading comprehension fail in the kitchen just recently. It probably didn’t help that I was a little sleepy and hungry at the same time. I took my slab of pork belly and sliced the skin off when I clearly wasn’t supposed to, and then realized my mistake a little too late. No matter! I trussed this skinless sucker up and popped it in a bag with yesterday’s marinade (which did NOT freeze. Take note of that, folks. It ain’t gonna freeze, so don’t even try) and sealed it with my FoodSaver. I have the V3240 model and am trying to get the hang of vacuum sealing a bag with liquids. Much cursing happened, but I managed to stop the vacuuming as soon as it was sucking up liquid. Double sealed that bag just in case, and into the sous vide it went at 155°F. I’m using the Sous Vide Supreme a friend gave us broken and we were able to fix. I’ll update with the results after letting it cook for about 36 hours. Wish me luck! Just a sneak peek photo post. Can you guess what deliciousness is getting made? Happy New Year everybody! I hope everyone had a fantastic holiday season (eating great food of course). My entry today actually utilizes a unique gift given to me by none other than Nerf 1: pasta caberneti! 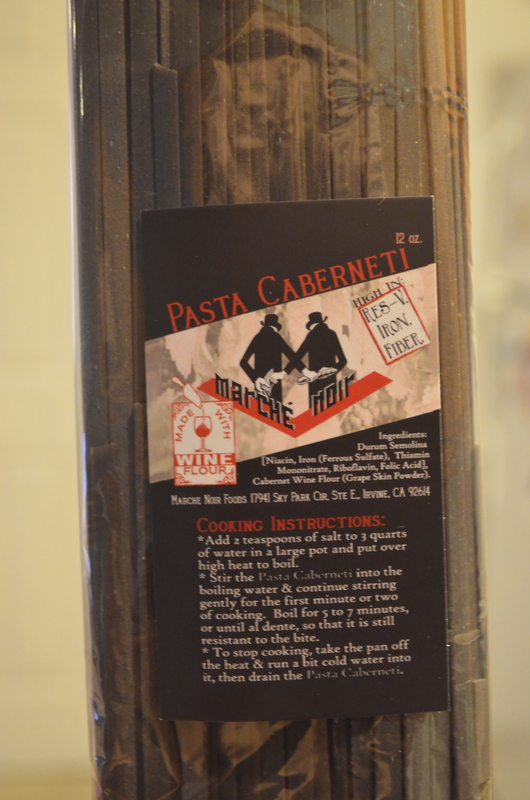 This pasta is made with cabernet sauvignon wine flour that gives the pasta a bold color and unique taste. Since I had never had this kind of pasta before, I wanted to make a simple dish that would let noodles be the center of attention. Therefore I didn’t use a heavy sausage or chicken but used sautéed mushrooms. I didn’t follow a recipe, I just kind of used whatever I had in the kitchen so everything was eyeballed and not measured. Below I list all the ingredients that I used and the approximate measurements. Buon divertimento! Bring water to a boil. According to the package instructions it was six cups of water with one teaspoon of salt for half the package of pasta. In a separate sauté pan heat the olive oil and butter over low-medium heat. Add the minced shallots and garlic and sauté for a couple of minutes. 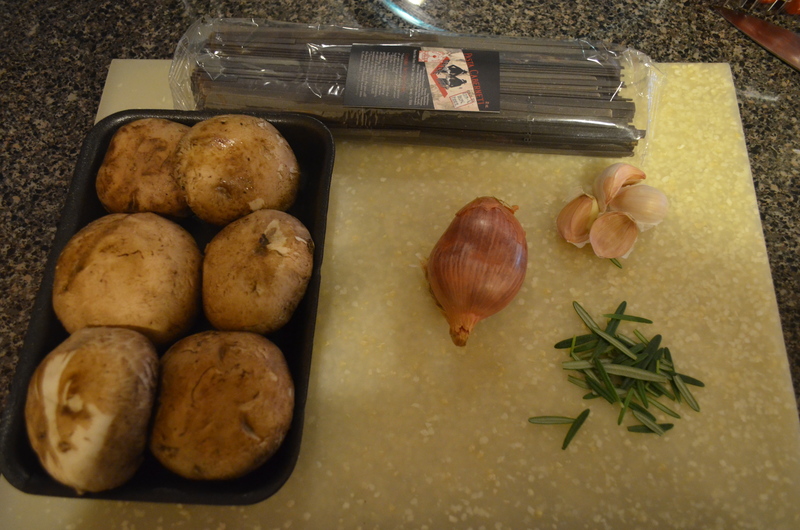 Next, add the fresh rosemary and sauté until fragrant about 30 seconds to a minute. Finally, add the mushrooms and sauté until soft. I added a tiny bit of water to help with the softening of the mushrooms. Once the pasta was al dente (about seven minutes) I added the cooked pasta directly to the sauté pan with the mushroom mixture and tossed all together. When the pasta was plated I sprinkled a small mixture of romano and parmesean cheese on top. Hello all, it’s been awhile and I’m sorry about that, but as Nerf 1 pointed out I recently moved to Chicago and am just starting to get settled down. Even though it’s mid December, the weather here has been surprisingly warm for the past six weeks I’ve been here but we had our first really big rainy day yesterday. What better dish for lunch than soup on a rainy day? But I didn’t want just Campbell’s chicken soup, I wanted something healthy with some saltiness and not too much fuss so I went to my go to favorite dish of udon with shitake mushrooms and spinach. It’s not quite a soup because there isn’t a bowl full of broth but I really love it because it’s easy and quick to make. I got the recipe about a year ago off of NPR from an article all about tofu but because the recipe is so simple I don’t follow it exactly. 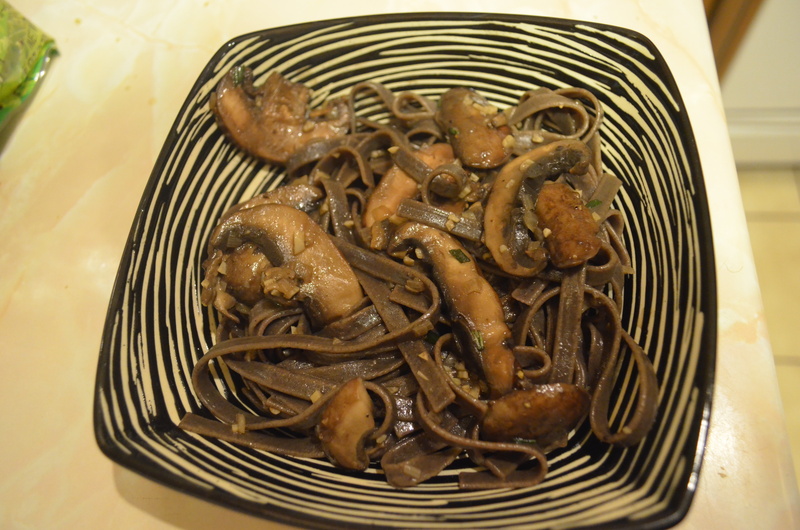 For example, the recipe calls for about 10 shitake mushrooms, but I love mushrooms so much I add about 20 and a mixture of shitake and oyster. Basically I use whatever amount of whatever I have (half a bag of spinach instead of the instructed 4 cups of spinach) and it comes out tasty every time. Here is the recipe but tweak it however you’d like! 2 teaspoons of olive oil (I honestly forgot about this ingredient all the times I’ve made this. I just either use the toasted sesame oil left behind or use a little more from the bottle). Cook the udon according to the package instructions. Over medium heat, heat the toasted sesame oil in a pan. 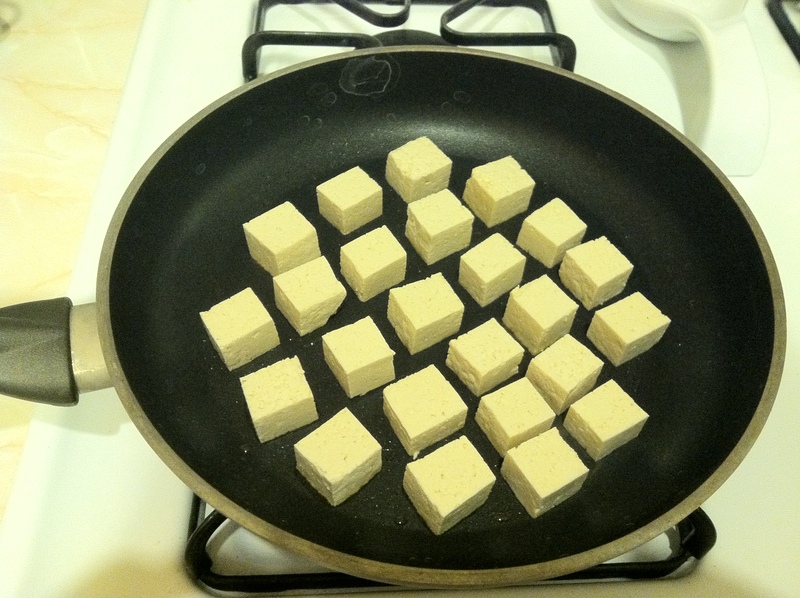 Lightly fry all sides of the tofu cubes; when finished put in a bowl and set aside. Now add the olive oil to the same pan and add the garlic cooking for a few minutes over low heat. 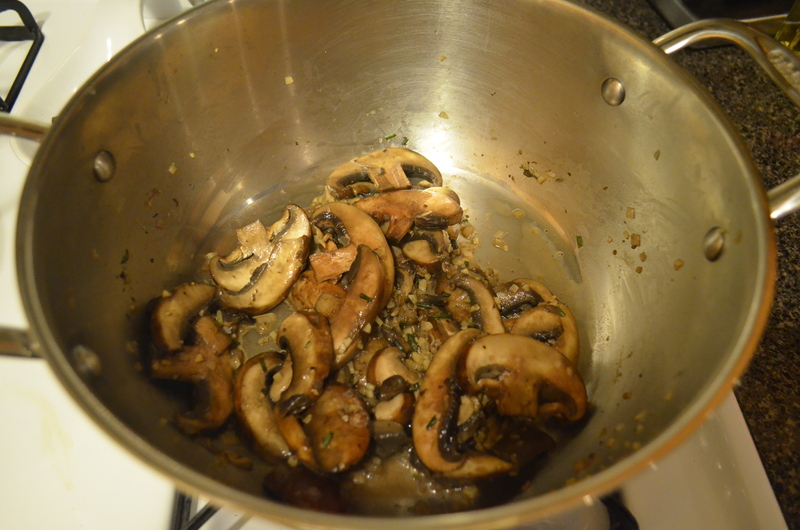 Add the mushrooms and a tiny bit of water; cook until tender. 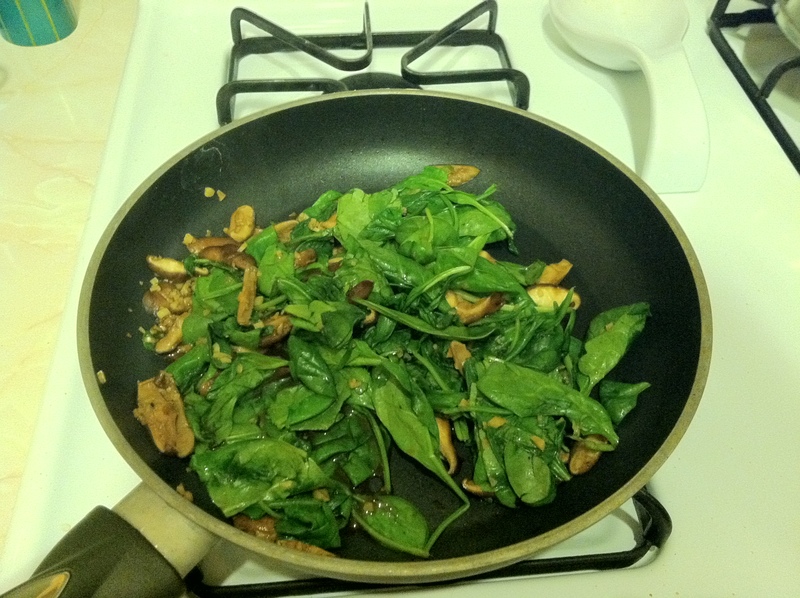 Add the spinach and soy sauce and cook until spinach is wilted. After being drained, add udon noodles and mix into vegetables. 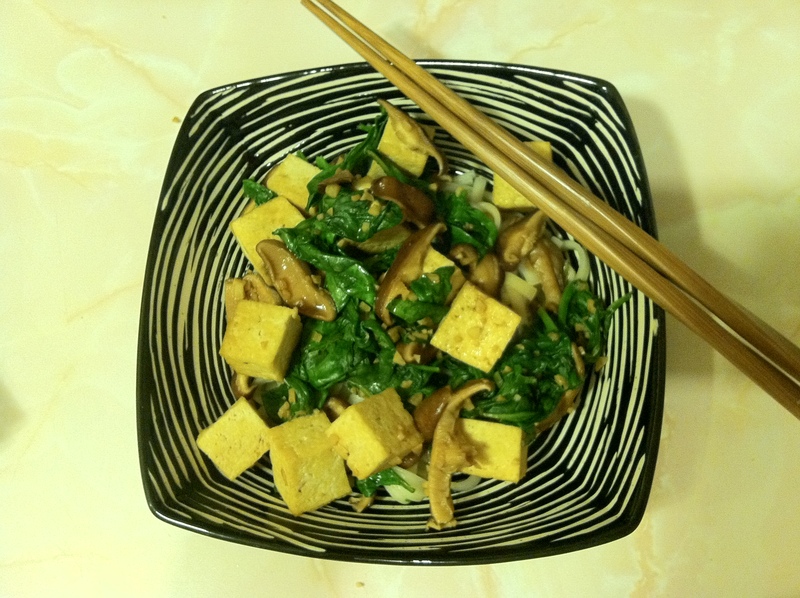 Toss in tofu and sesame seeds. So some big things have been happening here at NWF which would explain our period of non-activity/silence. First, lil ole me (Nerf 1) got married to The Dude in October. Nerf 2 was my maid of honor (she was an AMAZING MoH) and Nerf 3 (Darlene) and Friend of Nerf (Jennifer) were my bridesmaids. I had 2 (count ’em, TWO) ceremonies and receptions, which drove me kind of crazy. It’s tough enough to plan one wedding, but it’s a whole ‘nother monster to plan two. We had a ceremony and reception in San Diego for a little over 100 people and then a tea ceremony and reception up in LA for about 250 people. Fun times, but I would not recommend this for the faint of heart and the short of patience. Immediately after the two parties, The Dude and I hit up Fiji for our honeymoon! It was our first trip to Fiji and my first time out of the country (Rosarito back in college didn’t count since everyone spoke English and took American dollars). I had an amazing time and experienced a week in a world so different from the one I grew up in. We took a lot of pictures, so that post will be coming soon! I would highly recommend everyone to go to Fiji. It’s only a little more than Hawaii budget-wise, but worth the extra mile. While we were on our honeymoon, Nerf 3 (Darlene) moved with her Paul to Chicago. 😦 I have to admit, I was really sad that she was leaving since she’s my main cooking buddy. The good news is that she will continue to contribute to the NWF blog and tell us of her amazing adventures in the Windy City. Chicago is definitely a cool place to be if you like food. I’m looking forward to her posts on deep dish pizza, Chicago dogs, and the crazy weather there. Thanksgiving came up quick, then I went with The Dude on his business trip to Seattle, WA. While The Dude was busy in meetings all day, I got to explore a lot of the city (in the rain) and what a great place it is! The air there is so crisp and it smells like winter and Christmas. I’ll have to admit, I kind of liked the rain. But I don’t know if I’d like it so much if it rained everyday for weeks and weeks. Once you’re in the city, it’s quite easy to get around and a lot of fun to explore. I went a bit Facebook Check-In crazy (sorry FB friends of mine) and that should help me retrace my steps and put words to my pictures. So…keep an eye out for our new posts and thanks for still tuning in!